She bought a handful of scratch off tickets at the Radiant Gas Station in Tampa on her way home from work. She took out a lucky penny and scratched away and in just a few minutes, had won back six bucks. Winning a few bucks is one thing, but what about those top prizes? Whether it’s a million dollar ticket or a $100,000 jackpot you’re hoping to hit, many people don’t realize the lottery continues to sell tickets even after the top prizes are gone. If you read the small print, your ticket often says something like “Please note: prizes, including top prizes, may be unavailable at the time of ticket purchase.” Melissa said she didn’t know that, and she wasn’t alone. Other customers at the gas station didn’t either. “So, I might be playing numbers, I can’t even hit the big prize?” asked Kenny, another Radiant customer. That’s right. So, what can you do about it? Go to your lottery’s website before you buy scratch off games. Most states, including Florida, post how many prizes are left for each game on their website. I checked out the Florida Lottery website and searched “remaining prizes.” A list popped up of all the Scratch Off games and how many top prizes were left in each one. For example, on this day, only 4 out of 6 top prizes were left for the Flamingo game’s top prize of $25,000. And zero of three were left for the one million dollar Season’s Greetings game. You can also check the overall odds for games to give you a better sense of your chances to win big prizes or small. Longtime Florida Lottery employee Jack Higgens says there are some secrets to picking a winner. “The overall odds are better as the prices go up,” he says. Tickets range in price from one dollar to $25. Another tip from Higgens is to have all your scratch-off tickets scanned by the cashier, even if you think you lost. “Don’t just throw your losers away, you might have a winner!” he said. In fact, Melissa went to cash in her tickets thinking she had won four dollars, but was pleasantly surprised when the cashier told her it was actually six dollars. “Oh, six? Hey!” she nodded approvingly. 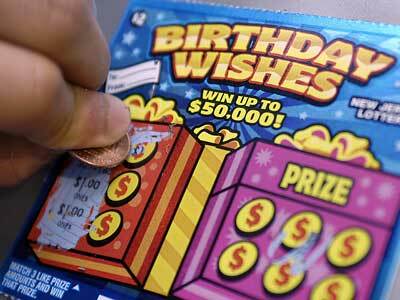 Playing scratch-off games can certainly be fun, but it’s not a good idea to spend more than you can afford to lose. In the end, it’s still a game of chance. No matter how much you spend there’s no guarantee you’ll win. But when you do, whether it’s a dollar or more, you can’t beat that sudden rush of adrenaline. “Yes!! I won ten dollars! Right there!” shouted Rhonda Stroll, pointing to her scratch off ticket with a big smile.